Butterfinger ice cream sandwiches. You Butterfinger fans are drooling already, I can tell. In bowl of electric mixer, cream together butter and sugars until very light, about five minutes. Add eggs, one at a time, mixing well after each addition. Stir in the vanilla. With mixer on low, add dry ingredients and mix just until combined. Stir in 1 and one-half of the Butterfinger chips with rubber spatula. When ready to bake, preheat oven to 350 degrees. Line insulated baking sheets with parchment paper and scoop dough into 36-balls using an ice cream scoop onto sheet. Bake 10-12 minutes. Take the 2 cartons of ice cream out of the freezer to let it soften a bit. Meanwhile, mix up your cookie dough, using 15 ounces of the Butterfinger Baking Bits. Reserve the other 5 ounces for rolling your finished ice cream sandwiches in. Line the jelly roll pan with parchment paper overlapping all sides. Place the softened ice cream into a large bowl and stir it up like you used to when you were a kid. Pour that softened bowl of ice cream into the lined pan and spread, spread, spread until it's even. Place that pan in the freezer until the ice cream firms back up, about 2 hours. If you don't have a kitchen scale, it's a really good investment and they are quite inexpensive. I have an Ozeri kitchen scale that runs about $15. I use mine all the time and weigh just about everything. It's the best way to divide food evenly! You'll notice this in the video above... I highly recommend weighing your cookie dough when you're done mixing it. Then divide that total in ounces by 36. When you measure out the dough and use the same weight for each cookie ball, you will be rewarded with 36 perfectly round beautiful cookies from this recipe. However, if you don't weigh the dough balls out you may not have similarly sized cookies in the end. And believe me, when making ice cream sandwiches you want your cookies to be the same size. when you bake the cookies you want them to be soft, and slightly under-baked. I baked mine for 11 minutes and they were perfect. My cookie recipe yields 36 (3 1/2-inch) wide cookies so you will need a cookie cutter approximately that size to cut out the ice cream middles. You can use a cookie cutter (I linked some above for you), a biscuit cutter or even a plastic drinking glass. Heck, I used an old plastic hamburger press I've had around for years! it looks very similar to the one in the upper left of this picture. All your cookies should be cooled completely before starting this process. Have a pan handy to transfer the finished sandwiches to. Pour remaining 5 ounces of Butterfinger Baking Bits onto a plate. Cut parchment into strips (approximately 3" x 12") for wrapping around your sandwiches. Note that depending on how fast you work, you may need to move some of the sandwiches to the freezer before finishing the others. Have paper towels or a damp cloth handy to wipe your sticky fingers as you work. Fill a medium bowl with water to dip the cookie cutter in between ice cream cuts (see below). Remove pan of ice cream from the freezer and using your cookie cutter, cut out 12 circles. It helps to dip the cookie cutter into a bowl of water after each cut to keep the ice cream from sticking to the cutter. Use an icing spatula to remove the excess ice cream around the circles. Yes, you can eat it, I won't tell. If needed, place the pan of ice cream circles back into the freezer until you are ready to assemble. Match up 12 pairs of cookies according to size. This should be easy if you weighed your cookie dough. Use a spatula to lift an ice cream circle and sandwich it between two cookies then roll the sandwich in the Butterfinger Bits. Wrap the outside of the sandwich with a parchment strip and place on pan destined for the freezer. Freeze sandwiches until firm, several hours will work, but overnight is best. 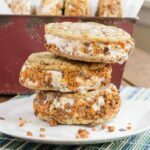 This recipe for Butterfinger Ice Cream Sandwiches was printed from AmandasCookin.com - https://amandascookin.com/butterfinger-ice-cream-sandwiches/ and can only be printed for education or personal use.